With the summery weather to which we are not so accustomed having us all gazing longingly out of our office windows and reaching new levels of discomfort on the Tube, here’s a few ideas for things to do on your days off in July to really make the most of the sunshine. If you’re looking for something to do as a family, you could certainly do worse than the upcoming Open East Festival on the site of the 2012 Olympics that celebrates the rejuvenation the area has undergone. You can enjoy the myriad attractions being put on this year with drumming workshops, BMX displays, theatrical productions and so much more. There’s music from The Waterboys, Mali Foli Night (described as a journey through Malian music) and everything from techno to reggae via hip hop and big-band drumming. 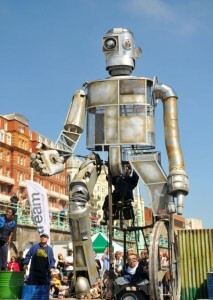 You could also seek out Up Projects (the floating cinema experience) or see Graeae’s The Iron Man (adapted from the Ted Hughes story) with a metal puppet taller than a double-decker bus. After that you’re sure to have worked up an appetite so why not sample the food on offer at the Real Food Festival and slake your thirst with local brews from the Ten Mile Beer Festival. The closing of the festival should be worthy of Willy Wonka himself as the mad-food-scientists Bompas and Parr promise something spectacular. Check out the Official Website for more info on the acts and to book tickets. 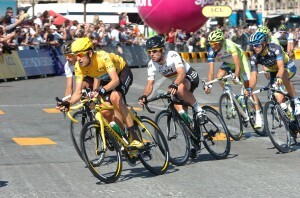 But with the Met Office cautiously forecasting continued summer weather and the event being both absolutely free and open until 10pm each day, why not take a cab down after work, whether you’re a Tour aficionado or you’ve yet to discover the excitement of the peloton. 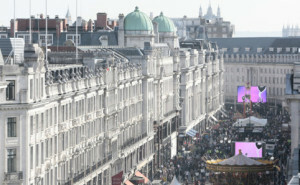 Every Sunday this July, Regent Street will be a traffic-free zone, allowing people to enjoy a relaxing day at the shops and the themed special events being held there over the next few weeks. The theme for this Sunday is Senses, promising food and drinks tasting as well as surprises of the aural and olfactory variety. Sunday the 21st focuses on the theme of Fashion in partnership with the Victoria & Albert Museum and will see the installation of a 100 metre catwalk on the famous thoroughfare. On the final Sunday of the month, Regent Street will be showing its green side with a Garden theme allowing florists and gardeners to turn the area into a miniature London park complete with picnic areas and benches amongst the foliage and flora. The Queen will be opening her garden to the public this summer, celebrating the 60th anniversary of her coronation. From Thursday the 11th until Sunday more than 200 businesses that hold a Royal Warrant of Appointment (having provided goods or services to the royal family for more than five years) will be setting up marquees and showcasing their products to the public. So if you’d like to wander the royal gardens and have a picnic on the palace lawns, a meal in one of the specially constructed restaurants or sample royal products, styles and pastimes, why not book a cab to arrive in style (be aware, no taxis are allowed to pick up/drop off directly outside the gates). The tickets start at £30 and go up to £90 so it’s more of a commitment than an invitation to drop in, but for royal quality one would expect royal prices wouldn’t one? These are just a few of the things you can get up to in the capital this summer and whether you’re heading across town to a festival or to the airport on holiday ubiCabs will get you there quickly, safely and without breaking the bank. For some sport related options such as the Ashes and Anniversary Games see our earlier blog on summer sports to see in London. ‹ You can now catch ubiCabs in Manchester!